The draw bracket for the Players Championship Finals, which takes place next weekend in Minehead, has been confirmed after the 32 player field was finalised. Simon Whitlock, the number two seed for the £250,000 tournament, faces Jamie Caven in the first round. Third seed Michael van Gerwen, who has picked up seven Pro Tour titles in 2012, takes on defending champion Kevin Painter. Recently crowned Grand Slam Champion Raymond van Barneveld meets Steve Beaton, while world number three James Wade is up against Brendan Dolan. UK Open champion Robert Thornton will face Mark Walsh, while Mark Webster has been handed a tough first round tie against world number one Phil Taylor. Paul Nicholson, who won the £60,000 title in 2010, takes on Ronnie Baxter in the opening round, where Vincent van der Voort will meet Kim Huybrechts and Mervyn King meets Terry Jenkins. The 2012 Players Championship Finals take place at Butlins resort, Minehead from November 30 to December 2. The schedule of play will be released in due course. Michael van Gerwen won his seventh Pro Tour title of 2012 in sensational style with a 6-5 victory over Phil Taylor in the final of Players Championship 20 in Barnsley on Sunday. The Dutch star, who rises to number seven in the PDC Order of Merit following his latest triumph, hit finishes of 164 and 124 in the final two legs to come back from 5-4 down against the world number one. ‘Mighty Mike’, who also defeated reigning World Champion Adrian Lewis in the semi-finals, followed up last weeks Grand Slam of Darts quarter-final victory against Taylor with his first success over ‘The Power’ in a final. “It was a fantastic game and we both played well,” van Gerwen told the PDC’s official website. “Phil did some great finishing but at the end I hit two amazing big finishes and I’m very happy with that. van Gerwen reached the semi-finals of Saturday’s event, as did in-form Scotsman Robert Thornton, who made it to the same stage on Sunday, losing out to Taylor on both occasions. The weekend’s final Players Championship events of 2012 also saw Andy Jenkins seal his place in the upcoming Ladbrokes World Championships as one of the top 16 in the Pro Tour of Merit outside of the PDC Order of Merit’s top 32. 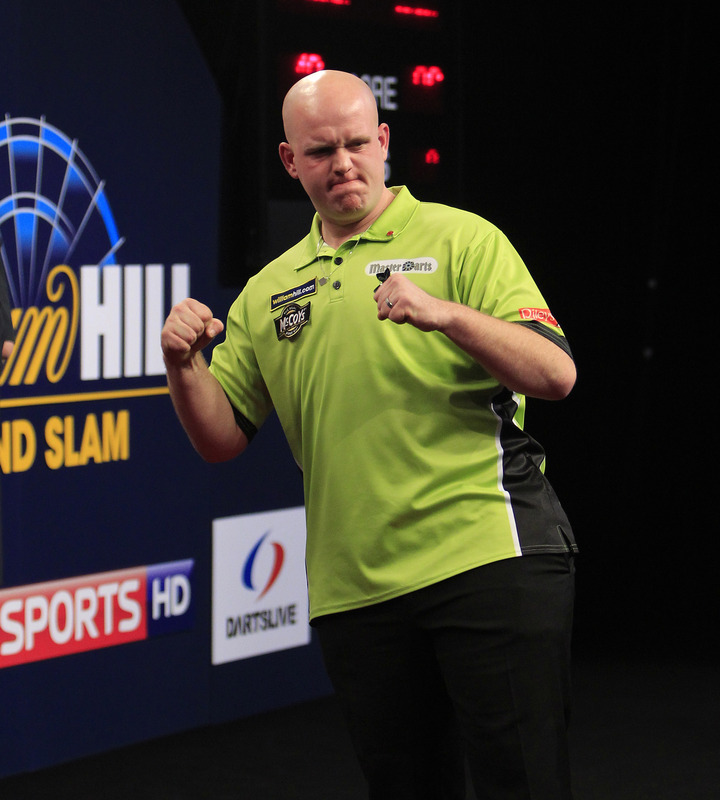 Click here for a full report on Michael van Gerwen’s latest triumph on his official website. Raymond van Barneveld clinched his first major title in over five years when he defeated Michael van Gerwen in a thrilling final at the William Hill Grand Slam of Darts. The popular Dutchman, saw off his in form compatriot with a 16-14 victory in Wolverhampton to claim the £100,000 first prize. ‘Barney’ broke van Gerwen’s throw in the sixth leg and managed to keep his lead despite the best efforts of his opponent, who sensationally hit a 170 finish for the third consecutive match. “This feels amazing,” said van Barneveld, who had earlier seen off Andy Hamilton to reach his first final since 2010. “Michael is a future World Champion and he could be the best player in the World. “I was really tired after my semi-final but everything has been brilliant since. van Barneveld opened the final with a 180 as he took the first leg, despite ‘Mighty Mike’ also hitting his first maximum. van Gerwen levelled on tops before throwing seven perfect darts in the third leg. That nine-dart attempt was in vain, however, as ‘Barney’ took out 101 to hold. van Gerwen drew level again before ‘Barney’ produced another brilliant finish in another leg where his opponent had hit a maximum, this time taking out 134 to take a 3-2 lead. It was the senior of the two Dutchmen who grabbed the first break of throw, as van Barneveld cleaned up 25 to increase his advantage to two legs. That became three when ‘Barney’ took out 70 for another break before van Gerwen’s fifth 180 helped him stem the tide, as he broke back immediately. The 23-year-old pinned double five to reduce the deficit to 6-4 before taking out 122 brilliantly on the bull to move within a leg of his compatriot. ‘Mighty Mike’ missed three darts at double eight to level the match, allowing van Barneveld to restore his two leg cushion. ‘Barney’ slotted in his second 180 on his way to taking an 8-5 lead. van Gerwen bedded double ten to take the 14th leg but not before van Barneveld hit his third maximum. The five-time World Champion restored his three leg lead by hitting tops but van Gerwen came back at him, following a 174 by pinning tops. The next three legs went with the throw, giving ‘Barney’ an 11-8 lead. van Gerwen hit his seventh maximum in the 20th leg, which he won with a clinical 74 finish under pressure. van Barneveld’s fourth maximum helped him hold to once again restore his three leg advantage before ‘Mighty Mike’ reduced it in sensational style, hitting his fourth 170 finish in his last three matches. The in form youngster hammered home his eighth 180 as he followed that magnificent maximum checkout with a break of throw. ‘Barney’ broke straight back though, taking out 95 to lead 13-11 before a fabulous 110 outshot took him within two legs of the title. van Gerwen took out 74 to hold but a brilliant 13 dart leg put ‘Barney’ on the brink of victory. ‘Mighty Mike’ kept the match alive when he took out 76 before bedding double seven to cut his opponent’s lead to a single leg. van Barneveld wasn’t to be denied though, as he produced a brilliant eleven dart leg to seal victory and taste major glory once again. Michael van Gerwen and Raymond van Barneveld will contest an all Dutch final at the William Hill Grand Slam of Darts after the pair sealed brilliant victories on Sunday afternoon in Wolverhampton. van Gerwen stormed past Dean Winstanley to reach his second consecutive major final, while van Barneveld defeated Andy Hamilton to reach his first final since 2010. ‘Mighty Mike’ produced a stunning 170 finish for the third time in two matches on the way to a 16-8 success over Winstanley. van Gerwen, the recently crowned World Grand Prix Champion, averaged over 100 in another dominant display. He said: “I had a great start and played well, which gives me great confidence but the job is not done yet. van Barneveld booked his place in the final with an impressive 16-10 success over World Championship runner-up Andy Hamilton. ‘Barney’ produced a brilliant period when he won 12 out of 13 legs to clinch a place in his first major final for over two years. “I’ve struggled for a couple of years but the form is back now and I hope it stays back,” said van Barneveld, who is chasing his first major title since 2007. Michael van Gerwen booked his place in the semi-finals of the William Hill Grand Slam of Darts with a magnificent performance on Saturday evening, while fellow Dutchman Raymond van Barneveld also progressed into the last four in Wolverhampton. van Gerwen hit two stunning maximum finishes of 170 in a 16-12 triumph over 2010 champion Scott Waites, with the Dutch sensation averaging over 106 in a brilliant match. “I was very happy to win the match,” said van Gerwen, who faces Dean Winstanley in the semi-finals. “I was not happy with some of my legs because I missed quite a few darts a doubles. van Barneveld saw off BDO World Champion Christian Kist with a 16-10 triumph, hitting twelve 180s in the process. ‘Barney’ averaged over 100 in the victory, which keeps the five-time World Champion on course to win a major title for the first time since 2007. “I’m really pleased to be through,”said van Barneveld, who faces Andy Hamilton in the semi-finals on Sunday afternoon. “It was important for me to win this game and I’m pleased it was shown live in Holland for people to see it. “I have to rest now ahead of the semi-final which will be a tough match but if I can keep playing like this I can win it. Michael van Gerwen booked his place in the quarter-finals of the William Grand Slam of Darts with a magnificent victory against 15-time World Champion Phil Taylor. The in form Dutchman, who recently won his first PDC major title at the World Grand Prix in Dublin, hit seven 180s and posted a fabulous 108.38 average in a brilliant match in Wolverhampton. van Gerwen won seven out of the last eight legs to triumph 10-5 over Taylor to move into the last eight of the tournament for the first time. “I’m so happy to win,” said ‘Mighty Mike’, who had won all three of his games in the group stage. “To beat Phil when he plays like that is very hard and I had to play what was one of the best games of my life. Taylor took the opening leg but van Gerwen levelled with the aid of his first maximum. ‘The Power’ edged back in front before ‘Mighty Mike’ produced a lovely 82 checkout, hitting the bull and double 16. The next three legs all went with the throw, with Taylor taking out 125 to move into a 4-3 lead. van Gerwen then went on a mini power surge of his own, however, hitting three more 180s as he took the next three legs. The ninth leg proved to pivotal, when Taylor missed the bull for a 167 checkout and ‘Mighty Mike’ stepped in for the first break of throw, finishing 91 to move ahead for the first time. He then pinned tops to double his lead, before taking out a brilliant 130 finish on the bull against the throw. The Dutch sensation took a fifth consecutive leg with another 91 checkout but the world number one pegged him back, despite van Gerwen hitting his seventh maximum. ‘Mighty Mike’ posted double 16 to move within a leg of victory, before sealing the match on tops. Robert Thornton and Arron Monk were denied last eight spots though. Thornton was edged out 10-8 by Scott Waites in a match where both players averaged over 102, while Monk suffered defeat at the hands of Dean Winstanley. The knockout stages of the William Hill Grand Slam of Darts begin on Thursday, when World Grand Prix winner Michael van Gerwen will take on world number one Phil Taylor for a place in the quarter-finals. van Gerwen, who won all three games in the group stage to progress to the second round, will meet ‘The Power’ in Wolverhampton after topping Group B ahead of Robert Thornton (pictured). Thornton also progressed after winning two of his matches in the round robin. The Scotsman, who won the UK Open in June, will take on Scott Waites in round two, with the winner of each match taking on each other in the last eight. 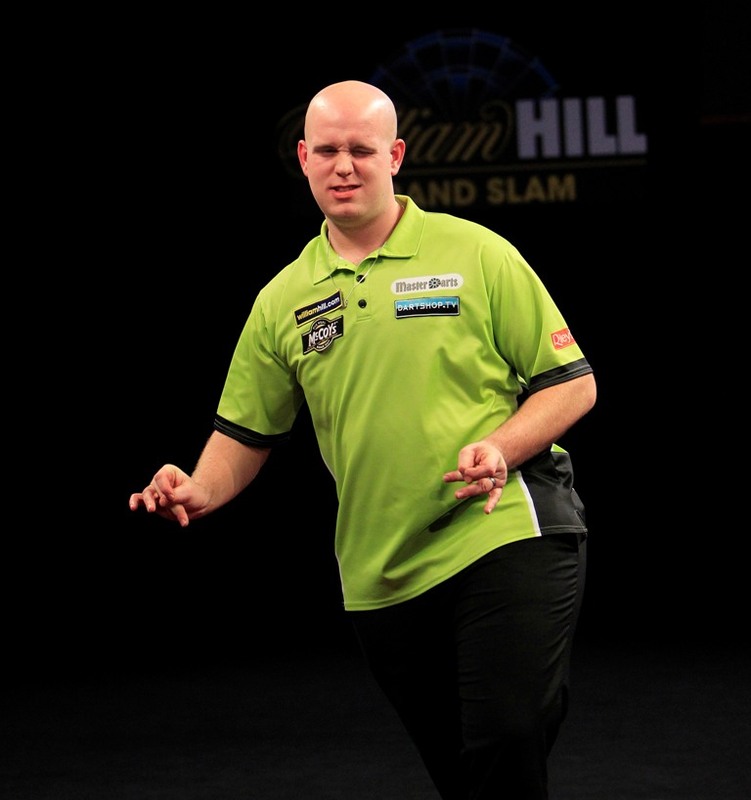 “I’m really looking forward to playing Phil,” said van Gerwen, who has been in sensational form in 2012. “I’ve been waiting to play him and I know he’s been waiting to play me. Arron Monk will take on Dean Winstanley, also on Thursday evening, while Raymond van Barneveld faces fellow Dutchman Wesley Harms on Friday. ‘Barney’ sealed his place in the last 16 with a 5-2 win over Wayne Jones. Michael van Gerwen set up a mouthwatering second round clash against world number one Phil Taylor at the William Hill Grand Slam of Darts after defeating Ted Hankey on Tuesday. ‘Mighty Mike’, who won the World Grand Prix last month, swept to a 5-0 victory over his out of sorts opponent, completing a hat-trick of round robin victories in Wolverhampton. The Dutch ace, who has been in brilliant form in 2012, topped Group B ahead of Robert Thornton, who also qualified for the last 16 following a 5-4 triumph over Steve Beaton. “It’s great to win my three group games and top the table,” said van Gerwen. Arron Monk also won through to the knockout stage after defeating Jan Dekker 5-1. Wednesday night sees the completion of the round robin stage for Groups E to H, with Paul Nicholson in need of a win against Andy Hamilton to progress. Raymond van Barneveld will face Wayne Jones as he bids for a place in the last 16. Paul Nicholson placed himself in strong contention for a spot in the last 16 of the William Hill Grand Slam of darts with a comfortable victory over Barrie Bates on Monday evening. The 2010 Players Champion, who had suffered defeat against Brendan Dolan in his opening match, cruised to a 5-0 win over the Welshman to pick up his first points of the tournament. “I felt like I needed to win emphatically tonight and I managed to do that,” said ‘The Asset’, who kicked off with a brilliant eleven dart leg, following three 140s with a clinical 81 checkout. Nicholson took the second leg too, pinning double five for a break of throw. The Australian hit double nine to take the third leg after just missing out on a 150 finish. He almost took out 124 in the following leg, before cleaning up the remaining 16 to move into a 4-0 lead. Nicholson completed the whitewash with a tidy 64 out-shot. ‘The Asset’ faces Andy Hamilton in his final Group F game on Wednesday. Raymond van Barneveld lost out in a last leg decider in his Dutch dual against BDO World Champion Christian Kist. However, ‘Barney’ is still well placed to progress from Group H ahead of Wednesday’s clash with Wayne Jones. Simon Whitlock and Michael van Gerwen both grabbed their second victories of the weekend, while James Wade also triumphed on day two of the William Hill Grand Slam of Darts in Wolverhampton. 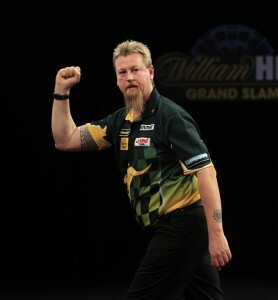 Whitlock edged a deciding leg to see off Kevin Painter, a win which moved him two points clear at the top of Group C.
“I scraped through there and I’m over the moon to win that one,” said Whitlock, the European Champion. “I’m in good form but there is still a lot of room for improvement. van Gerwen came out on top in a battle of in form players, with the World Grand Prix winner triumphing 5-3 over UK Open champion Robert Thornton. “It wasn’t an easy game,” admitted van Gerwen. “I started off well and then I started missing darts at doubles and it hurt me. Wade produced a strong performance to see off Holland’s Jan Dekker, with the world number three running out a 5-1 victor. “I did enough to win,” said Wade, who is back playing competitive darts for the first time since the World Grand Prix last month. Mervyn King all but booked his place in the knockout stage after a 5-3 victory over Arron Monk. ‘The Machine’ and King meet on Tuesday evening, when Monk takes on Dekker in the final round of games in Group D.
Both Wade and Monk still have the chance to qualify for the last 16. Mark Webster’s bid for a last 16 place is still very much alive despite a 5-2 defeat at the hands of Phil Taylor in Group A. The Welsh ace takes on Co Stompe on Tuesday evening in his final group game. Raymond van Barneveld made the perfect start to his Grand Slam campaign. The Dutch legend defeated Mark Walsh 5-0 in the afternoon session to top Group H after the first round of games. ‘Barney’, who hit a fabulous 141 checkout in the opening leg of his triumph, faces reigning BDO World Champion Christian Kist on Monday. Paul Nicholson will be looking for a win against Barrie Bates on Monday evening, after ‘The Asset’ was beaten by Brendan Dolan.